Serving as Canada’s first LEED Platinum certified office tower, Manitoba Hydro’s headquarters stands beautifully in the Winnipeg, Manitoba skyline. 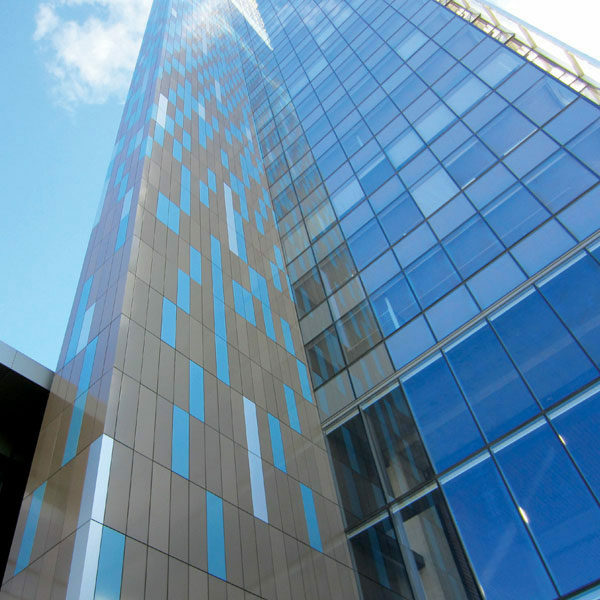 The building features aluminum composite panels that change in color from gray to a myriad of blues. The custom Alucobond bronze colored panels feature a Lumiflon FEVE fluoropolymer resin topcoat, further complimenting the building’s sustainability factor due to the durability and weatherability characteristics of the resin that prolong the lifespan of the substrate and eliminate the need to recoat. 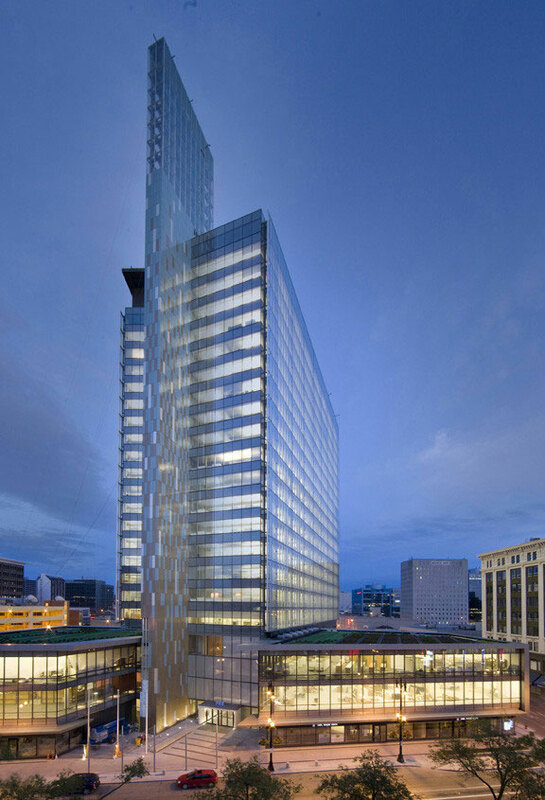 Alucobond aluminum panels cover 32,500 square feet of the building’s exterior installed by Thermal Systems. 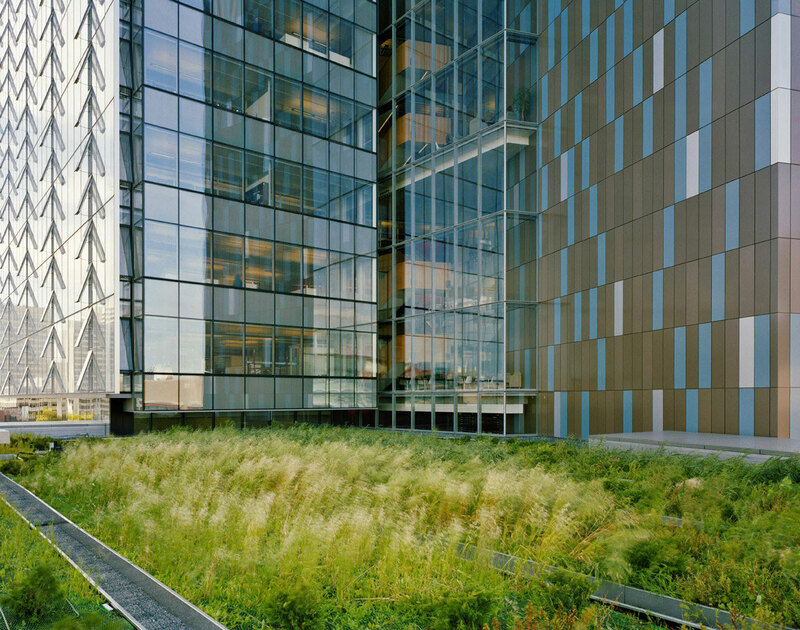 The Lumiflon-based topcoat allows for the aluminum panels to withstand temperature fluctuations without degradation of gloss and color. As an architectural coating resin, Lumiflon FEVE fluoropolymers have exceeded AAMA 2605 specifications, which represent high performance coatings expectations. Coatings that meet an AAMA 2605 specification exhibit superior resistance to humidity, ultraviolet degradation, color and gloss loss, chalking and chemical exposure. The longevity of FEVE fluoropolymer coatings also eliminate the need for frequent maintenance or recoating, which reduces air pollution, as well as lowers the life-cycle cost of the building altogether. 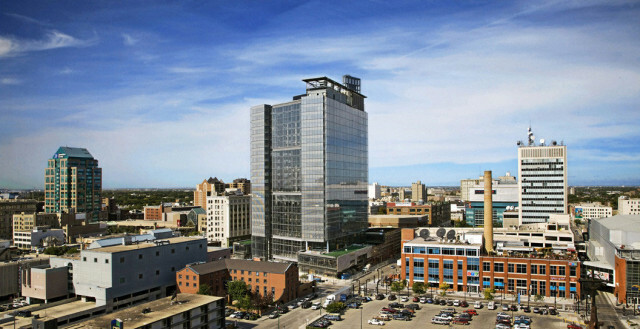 The Manitoba Hydro office tower was designed to promote energy efficiency, a healthy workspace and building sustainability. The use of a high performance coating on the aluminum panels further compliments the building’s design and purpose, as well as the accolade of LEED Platinum certification. LUMIFLON®, a product of the Asahi Glass Company, is a fluoropolymer resin that offers distinct advantages to the architectural market. LUMIFLON® provides architects with the option of using brighter colors and higher gloss, allowing gloss values as high as 90; offers the flexibility to be heat cured or cured at ambient temperature, giving fabricators a choice between shop application or application in the field; and can be used successfully on a number of materials, including steel, aluminum, fiberglass, concrete and polycarbonate for 30 years without fading.